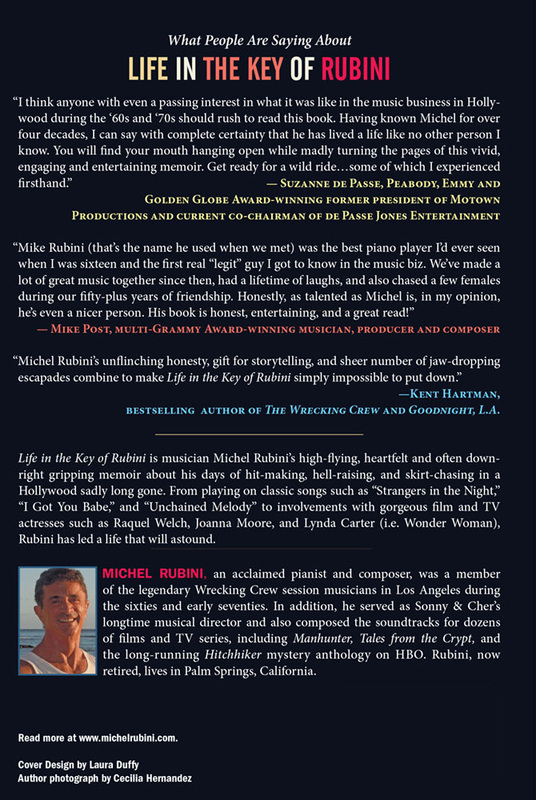 -KENT HARTMAN, BESTSELLING AUTHOR OF THE WRECKING CREW AND GOODNIGHT, L.A.
"Life In The Key Of Rubini" tells the story (in his own words) of Michel (Mike) Rubini, a key member of The Wrecking Crew … as well as musical director for acts as varied as Sonny and Cher, Nancy Wilson and Johnny Mathis. It's a fascinating tale that never gets boring (hell, the guy gets laid about every third page!!!) of Michel's adventures from child prodigy to highly-regarded session man to musical arranger to composer and conductor of soundtrack music. ... DIDJAKNOWthat two of the original founding members of Toto got their start as teenagers playing in Sonny and Cher's back-up band??? You'll find ALL kinds of fascinating facts like this in Michel's book! ), Nancy Wilson and Johnny Mathis to sessions with Frank Sinatra, Elvis Presley, Jim Nabors, Leon Russell, Barbra Streisand, Harry Nilsson and more. Ironically, one of his first assignments was arranging something for Raquel Welch, a then struggling, unknown singer / actress, only to find himself working with her again a decade and a half later when she was not only a star but considered to be one of the sexiest, most beautiful women in the world. Along the way, he would also date Lynda Carter, TV's Wonder Woman, on and off for several years. The book moves along at a fun and interesting pace as Michel recounts some of his favorite adventures. He was encouraged to write his memoirs by none other than Kent Hartman, who wrote the book on The Wrecking Crew, who became fascinated by all the incredible stories Michel was able to tell him while being interviewed for his own book. I, for one, am glad he followed through … as this is a fun trip down memory lane, taking a look at the "lifestyles of the rich and famous" in the anything goes '60's and '70's. 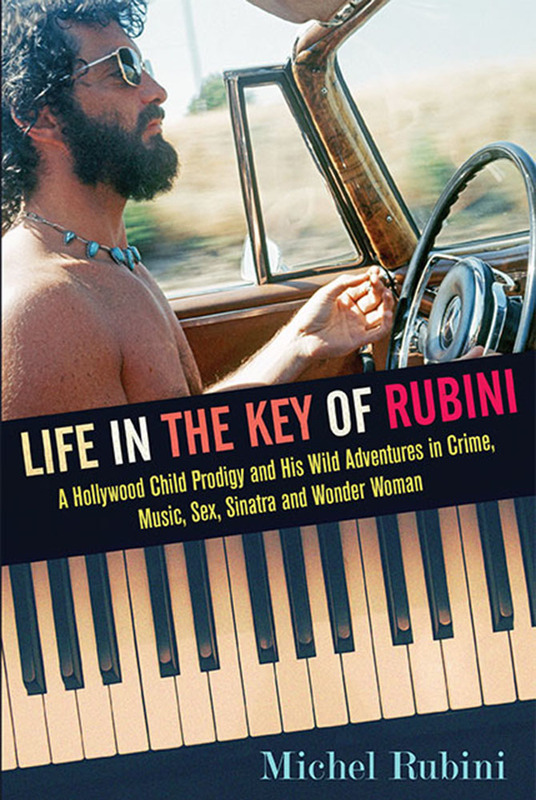 Life in the Key of Rubini is musician Michel Rubini’s high-flying, heartfelt and often down-right gripping memoir about his days of hit-making, hell-raising, and skirt-chasing in a Hollywood sadly long gone. From playing on classic songs such as “Strangers in the Night,” “I Got You Babe,” and “Unchained Melody” to involvements with gorgeous ­ film and TV actresses such as Raquel Welch, Joanna Moore, and Lynda Carter (i.e. Wonder Woman), Rubini has led a life that will astound." 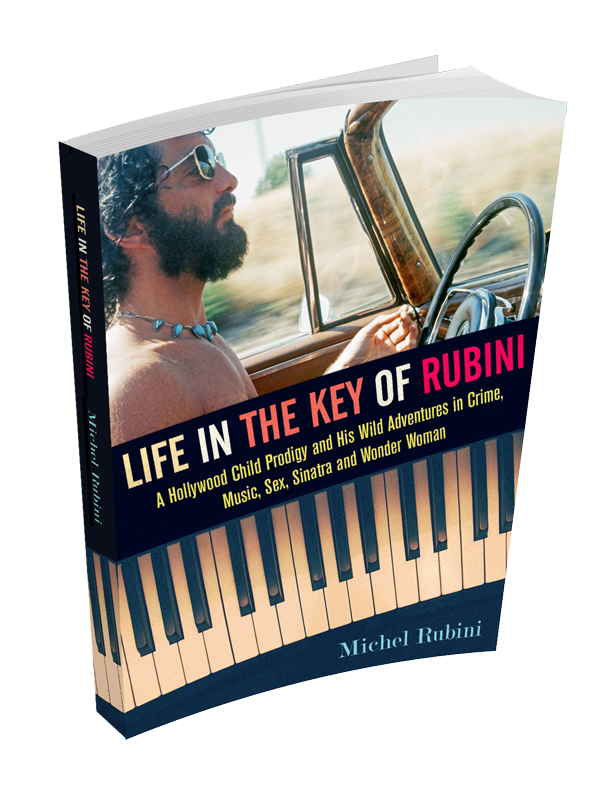 Michel Rubini, an acclaimed pianist and composer, was a member of the legendary Wrecking Crew session musicians in Los Angeles during the sixties and early seventies. In addition, he served as Sonny & Cher’s longtime musical director and composed the soundtracks for dozens of ­ films and TV series, including Manhunter, Tales from the Crypt, and the long-running Hitchhiker mystery anthology on HBO. 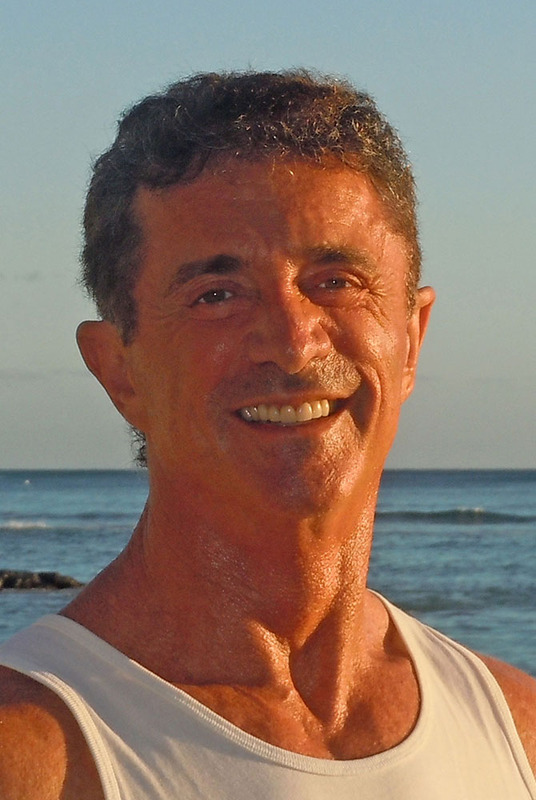 Rubini, now retired, lives in Palm Springs, California.